Santa Rosa has a long history of local Hockey action, from practices at Grace Bros Brewery and then more modern facilities at Summerfield Rd local clubs have always found a way to share their passion for the sport of Ice Hockey. Since opening in 1969, Snoopy’s Home Ice has been the Home Ice for local hockey clubs and the clubs have thrived in their new environment. Young athletes from Santa Rosa and the surrounding Sonoma County communities have been training and competing at Snoopy’s Home Ice on an almost daily basis. 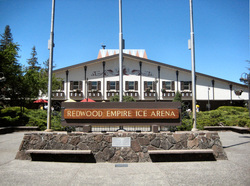 Snoopy’s Home Ice regularly hosts exciting hockey action at all levels from the NORCAL Mite Jamboree, to Snoopy’s Senior World Hockey Tournament, to the thrills and spills of Polar Bear College Hockey. With year-round programs for players at all levels from group lessons, to pickups, to adult leagues, Snoopy’s Home Ice offers a fun, friendly atmosphere for families to enjoy the sport of Ice Hockey. Show your Polar Bear Pride this season - come on down to the Coolest Place for Hockey Action.